Every girl dreams of the perfect wedding and when the day finally comes, they hope that everything runs smoothly! To remember this wonderful day, people usually do eleborate photoshoots but what happens when things go wrong? 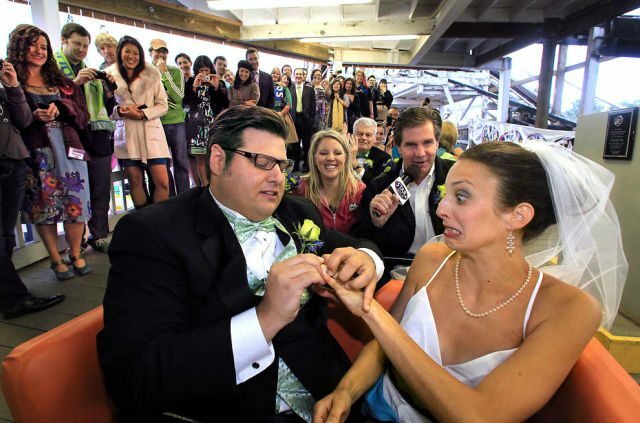 You may not think you can ruin a staged photo but this gallery shows that they can! Now, I have a mental checklist to make sure that these things don’t happen to me when my wedding day comes! Ah, dads. You gotta love them. 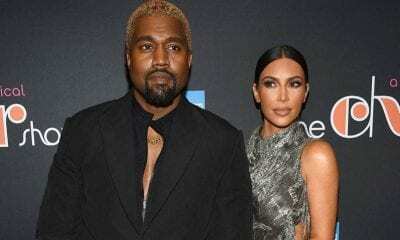 This boy is probably going to think twice before divorcing her! In many cultures, parents will start raising money for their daughter’s wedding as soon as the daughter is born, similar to the way many Americans will save money to cover the cost of a child’s college education! Now if this dad did that, he certainly wants to make sure his money is worth it! It is bad enough that at every family reunion or every time you go home, everyone asks why you are still single but at weddings, it is even worse! It will be even more obvious that you are alone and this picture proves just that. Did you know that the Siberians believe that it’s a sin to remain single? According to Siberian culture, the soul of a bachelor will turn into a dzheretinnik, or heretic, doomed to remain on the Earth forever scaring the living. Sorry, guy standing on the left! Did you know that Hawaii is the second most popular wedding destination? Over 25,000 weddings occur every single year in Hawaii alone. The #1 wedding destination is Las Vegas, which takes the lead with over 100,000 weddings a year! The guy in the background makes this photo less cliche! 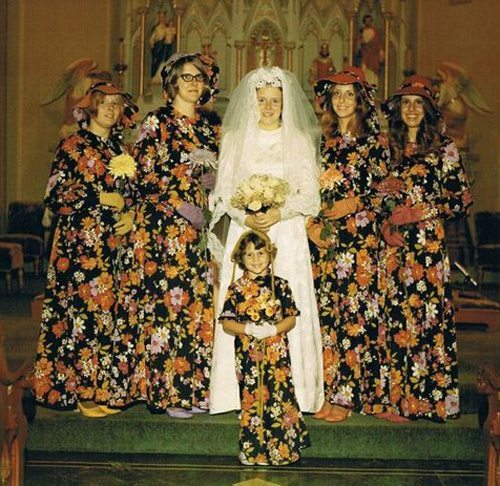 You know how bridesmaid dresses are usually, ehm, not very flattering? Well, you ain’t seen nothing yet. In the Orient, eyebrows are considered to be very alluring. Historically, a bride’s eyebrows would be shaved before her wedding, which was supposed to make her powerless to attract another husband. Yikes! 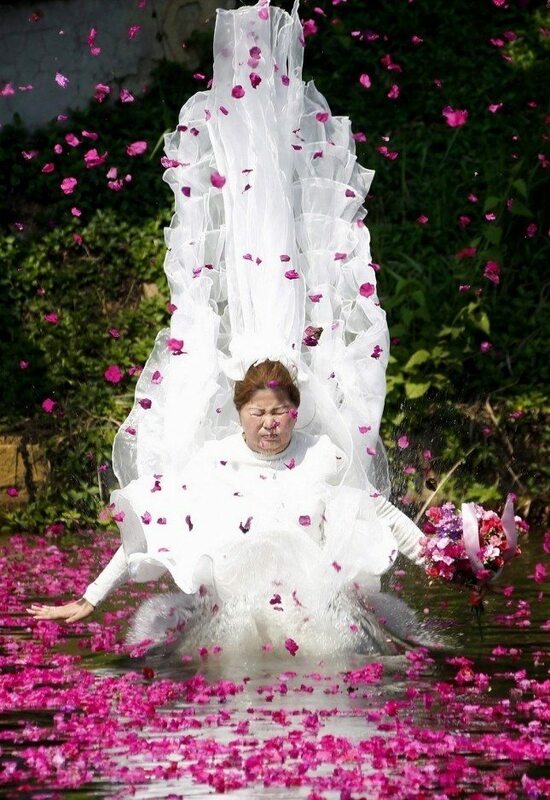 Yet, those bride photos can’t be as bad as this one! 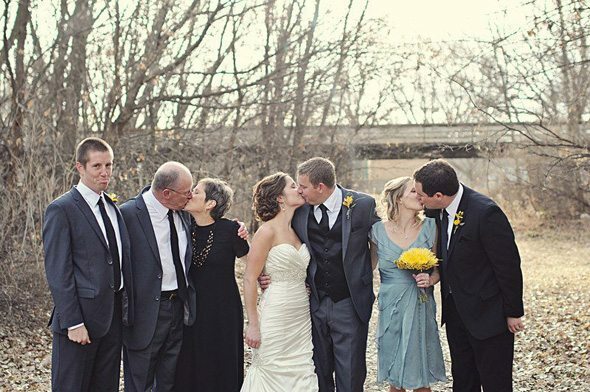 The next wedding photo is so awkward, you won’t believe it’s from an actual wedding! During Biblical times, shoes were seen as a representation of authority, as they lifted a person off of the ground, differentiating them from slaves or serfs. So, during a wedding, shoes were often used to seal the bargain! Fathers would often give their son-in-laws shoes as a symbol of transferring the authority. I don’t think that is what is happening in this photo, though…. Seriously, if they made a second Bridesmaids movie, this would definitely be the movie poster photo. I guess why take a normal photo when you can be weird af? The phrase “Three times a bridesmaid, never a bride” comes from the 16th century, as it was the belief that if a young maiden had been a bridesmaid 3 times, she would never be able to catch the eye of an unmarried man. However, if a young maiden was a bridesmaid 7 times, then she could break the spell and find a man to be her husband! I think one’s enough for these bridesmaids! I wonder if this guy looks back at this photo and tries to think about where he went wrong! 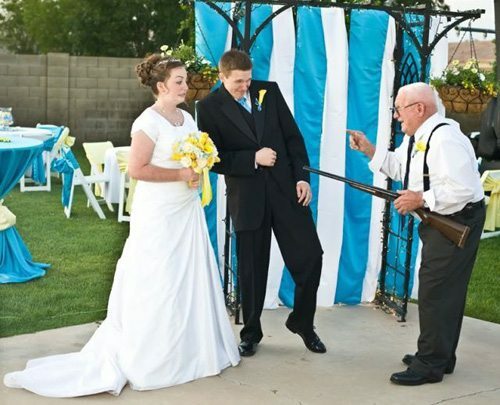 Obviously, this is a very public wedding! The reason that we put wedding rings on the third finger of the left hand is because the ancient Egyptians believed that there was a vein in that hand that ran directly to the heart. The Romans called this the “vein of love.” Seems like this lady has no such vein! The next photo is even more unfortunate than this one! This actually could have been such a cool photo if she was making a better face! I wonder if she meant to fall into the water…. 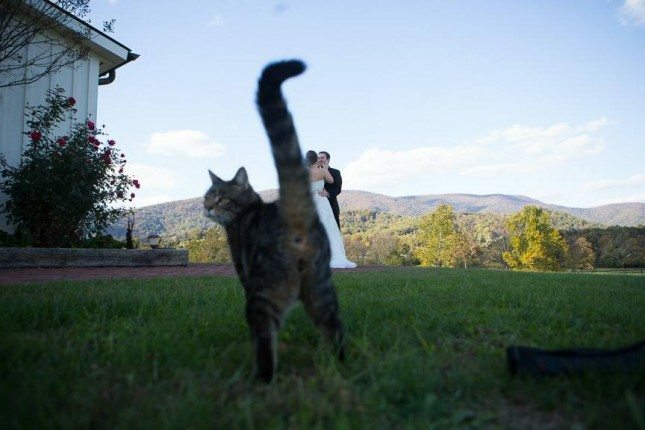 I guess the lesson to be learned here is to make sure your cat is locked away inside before you take your cute wedding photos! They literally don’t care about ruining your photo shoot! In the United States, wedding insurance is offered by Fireman’s Fund Insurance Company, which will cover any photographs that have to be retaken, as well as wedding attire or wedding gifts that might have to be replaced. I bet all of the people on this list sure wish that they had gotten insurance before their weddings! 10. Who ate too much cake? 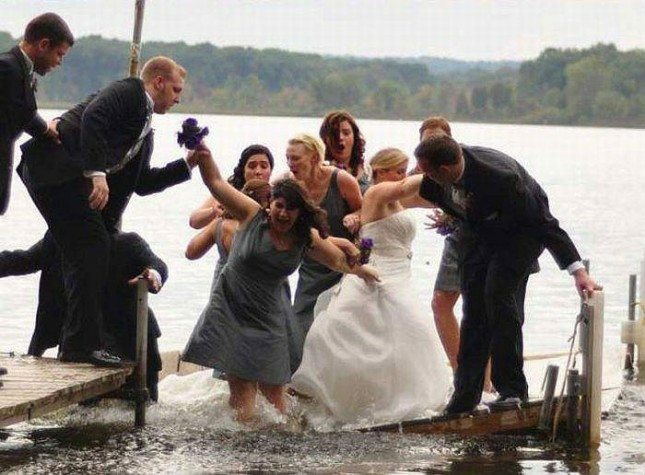 They should have probably checked to see how sturdy the dock was before they all walked on it… Props to the camera person, though, for capturing this moment! Did you know that the average wedding in the United States has 175 guests invited to the ceremonies? That’s definitely too many guests for this small dock! The next photo is of someone’s idea of a good joke. 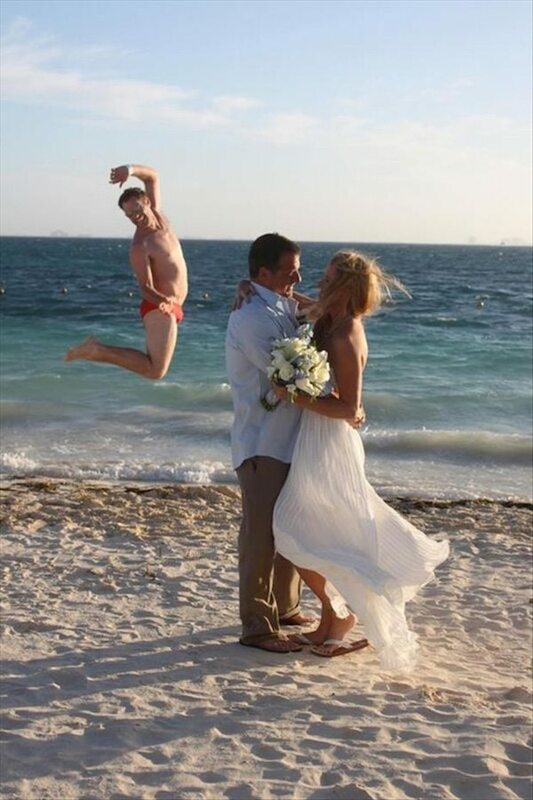 Well, maybe this one isn’t wedding photo fail! Although, this may be embarrassing to show your kids and grandkids! The tradition of groomsmen began in ancient times, as many grooms would traditionally kidnap the bride with the help of his trusty groomsmen. Then, at the wedding, the groom would stand next to the bride ready to use his sword to defend any jealous rivals that might arrive! Glad that tradition is over! 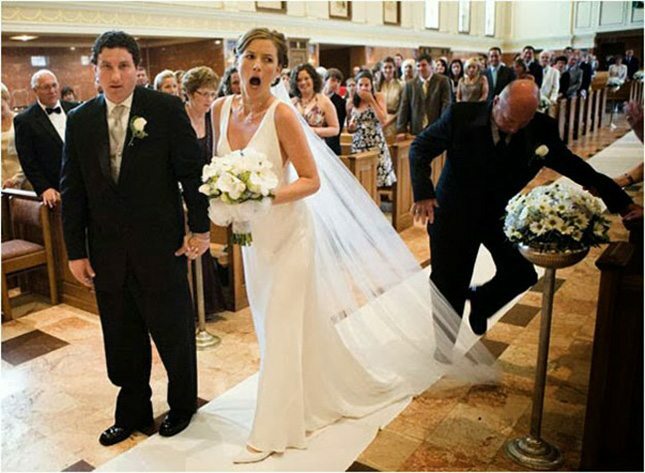 This is probably one of the worst things that can happen at a wedding! At least they still have that bottom section! Wedding cakes serve as symbols of good luck and fertility during a ceremony, and have been big parts of weddings since the times of the ancient Romans! In the era of the Romans, a small bun would be broken above a bride’s head towards the end of the wedding ceremony as a symbol of fertility. Then, in the middle ages, the bride and groom would kiss over small cakes, leading to the tradition we have now! 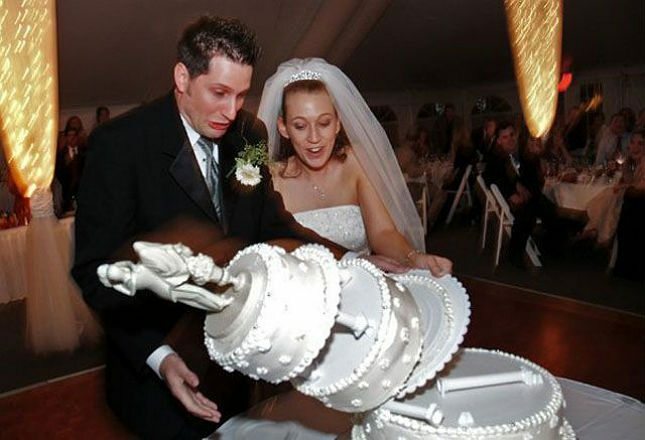 This couple might be getting bad luck, though! 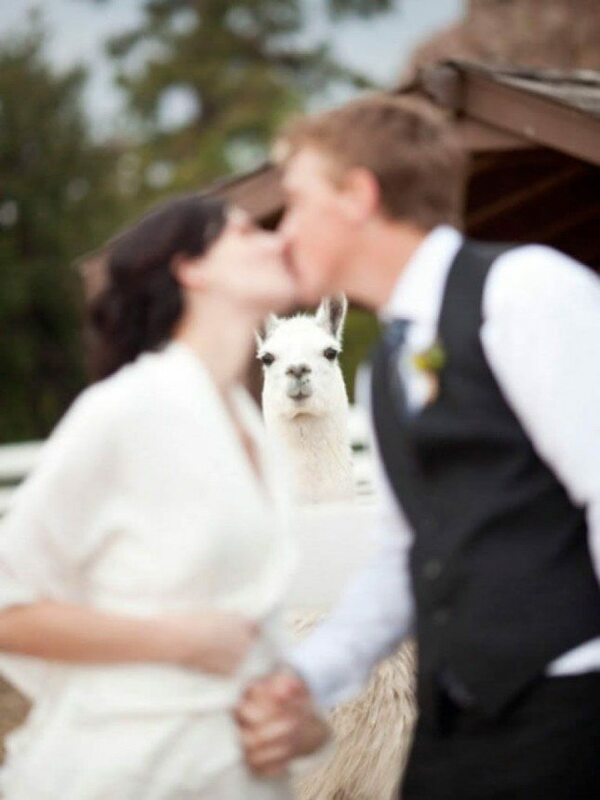 If you are going to have llamas at your wedding, expect them to photobomb your photos! They just love the attention! Maybe they should have planned this a little better. For starters, make sure no one’s face is around when you do a high kick! Green is a color that is avoided at all Scottish weddings because it is seen as being the colors of fairies and a dark omen of revenge. It’s considered so unlucky, that even green foods are supposed to be avoided during a wedding ceremony! I guess this girl should have picked a different color dress! The next photo isn’t exactly heart warming. 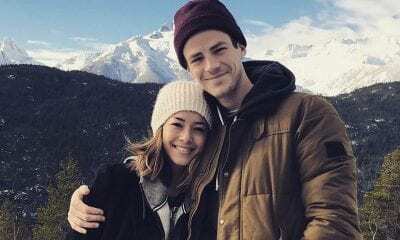 A lot of people dream of having a winter wonderland wedding but it may not be as pretty as you think. You may find yourself getting snow dumped on you! Who invited Death to the wedding? Now the question is, does he get invited to the afterparty? A bride’s veil traditionally serves as a symbol of her youth and virginity, and are also supposed to help ward off jealous spirits and the Evil Eye! Veils used to be different colors, but the modern white veil became popular during the Victorian era as a symbol of purity and modesty. 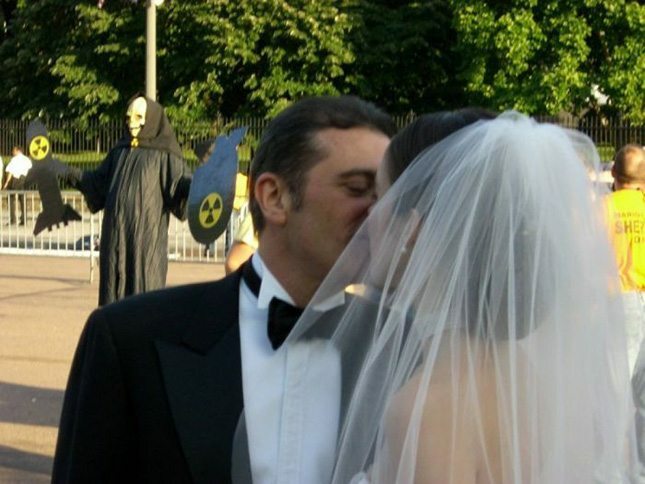 Do you think this veil might ward off that grim reaper standing behind her? 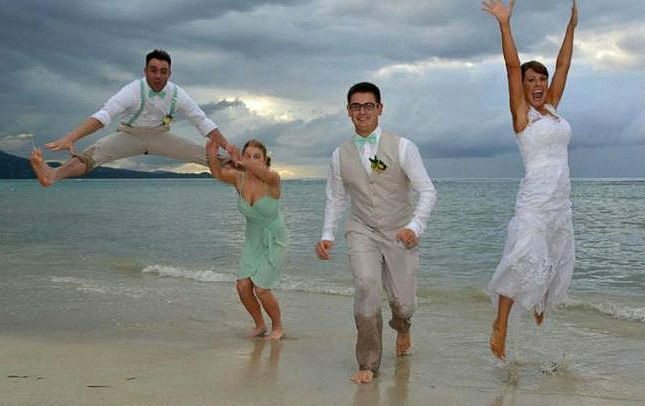 If you are going to do a jump photo with a floor length, puffy dress on, you should probably not bring your legs so far in! 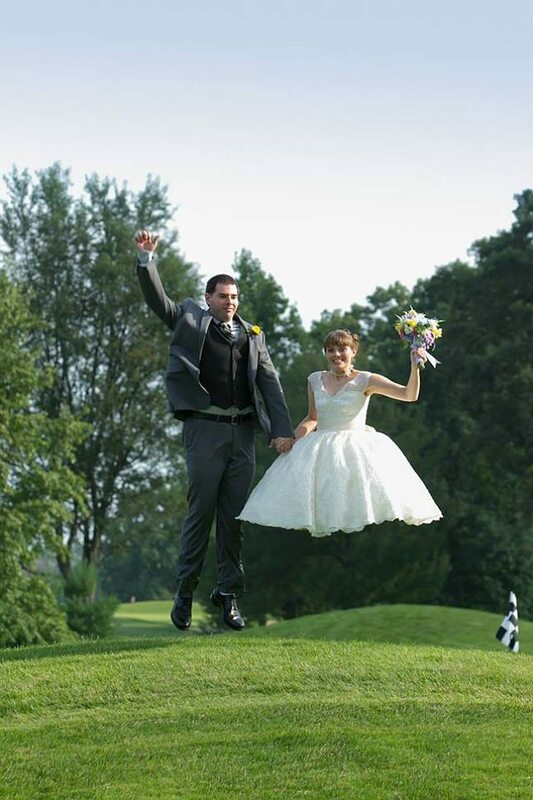 It looks like this bride is simply floating! Did you know that the first recorded instance of a jump shot photograph is considered to be in 1942, during a Wyoming basketball game taking place at Madison Square Garden? It’s now a staple of fun photography! The groom here doesn’t look like he is having much fun, though! The next photo is of an unintentional, and pretty confusing, optical illusion! Oh, so that’s why no one uses horses in wedding photo shoots! 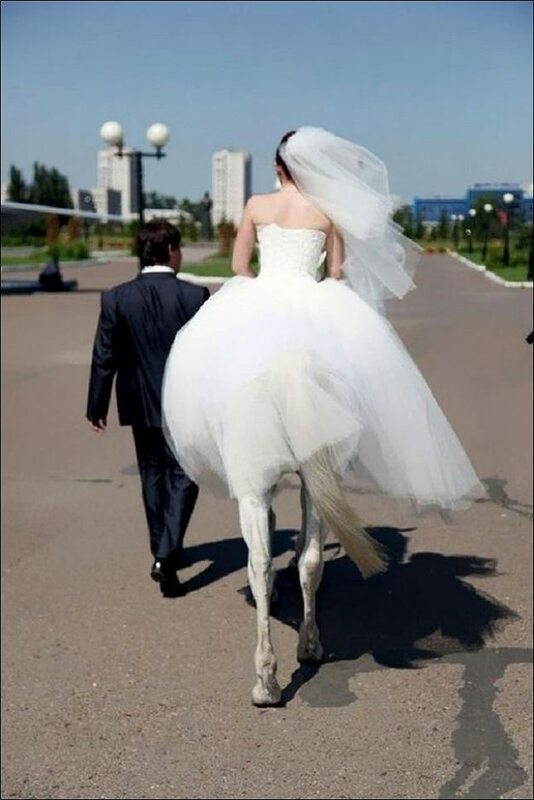 She be looking like a centaur! Horses have been used in weddings for centuries now! An old European tradition has it that it’s better luck to have a gray horse present during weddings, which is too bad for the bride in this photograph! 19. This grandma has had enough! Aw, how cute! 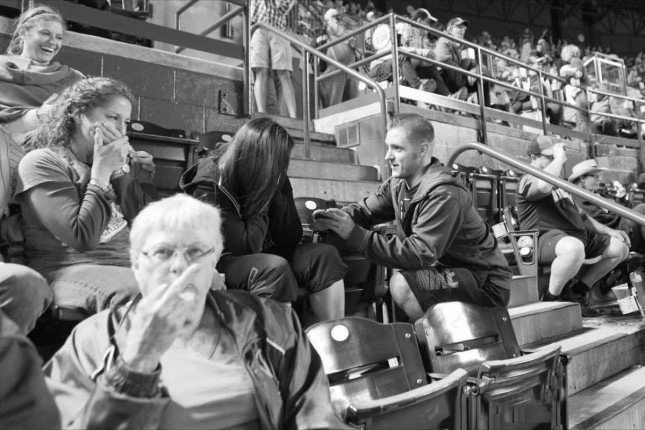 A proposal at a sports game! Well, looks like everything is happy about it except the grandma in the front! Maybe she had a bad proposal! 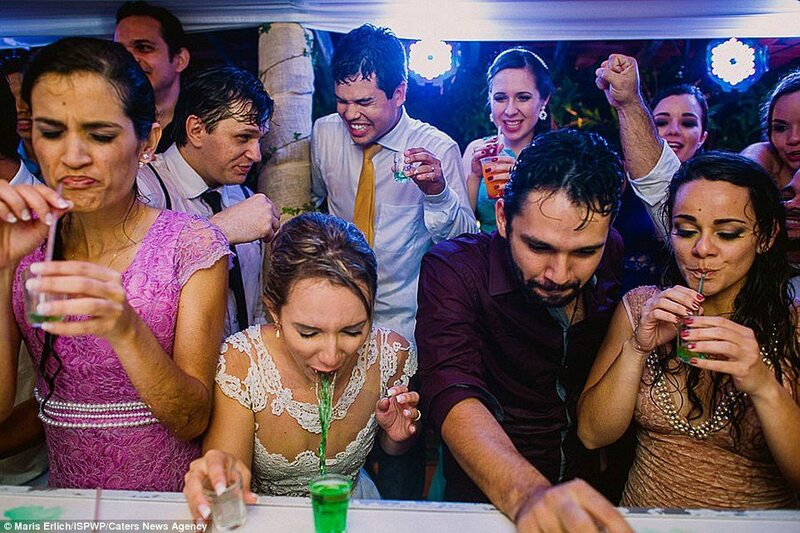 Looks like the bride wasn’t expecting her shot to be that gross! The fact that it was green makes it look even grosser! Maybe they should have hired a better bartender! Different cultures have different traditions when it comes to drinking at a wedding. In Greek weddings, drinking is prohibited, whereas in Mexican or Irish weddings, expect the booze to be flowing plentifully! Bet the bride is wishing she was Greek! The next photo is pretty adorable, though unfortunate! 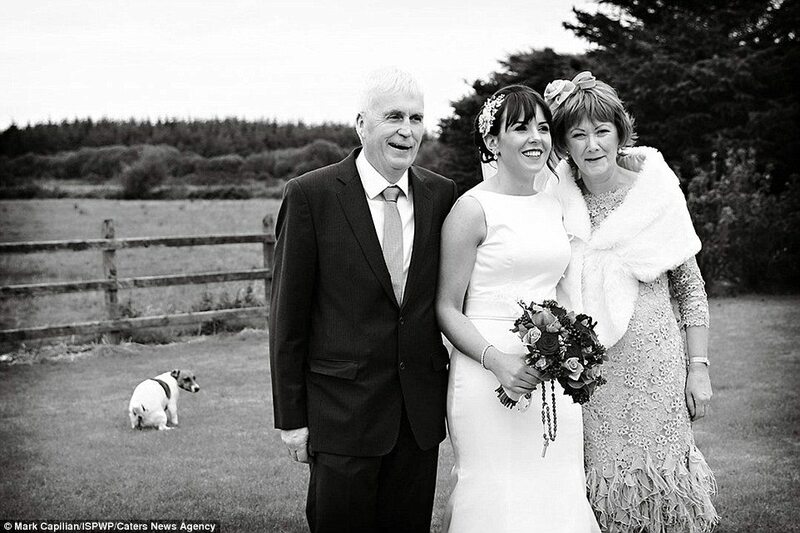 Cats may photobomb your wedding photo on purpose, but dogs genuinely don’t mean too! This poor pup just wanted to go to the bathroom! 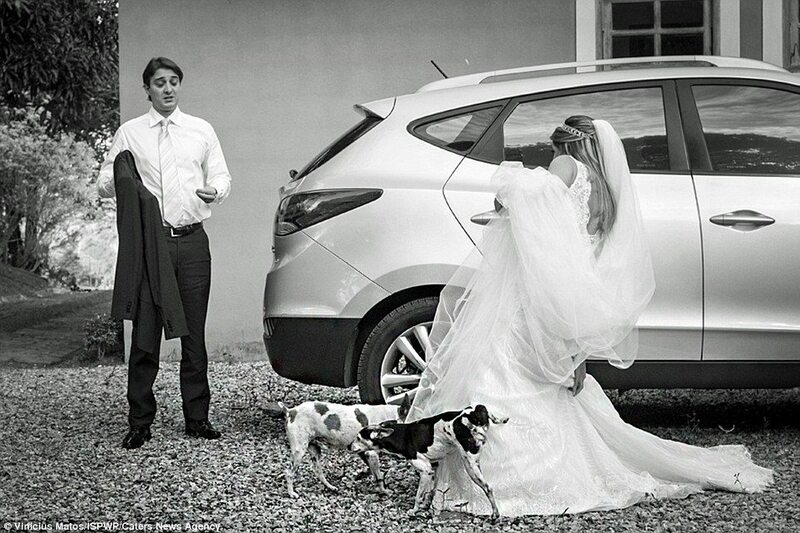 Did you know that dog weddings are actually a thing? Nobody is sure when the first dog wedding occurred, but dog weddings have been occurring for generations now! This dog probably isn’t getting married anytime soon! 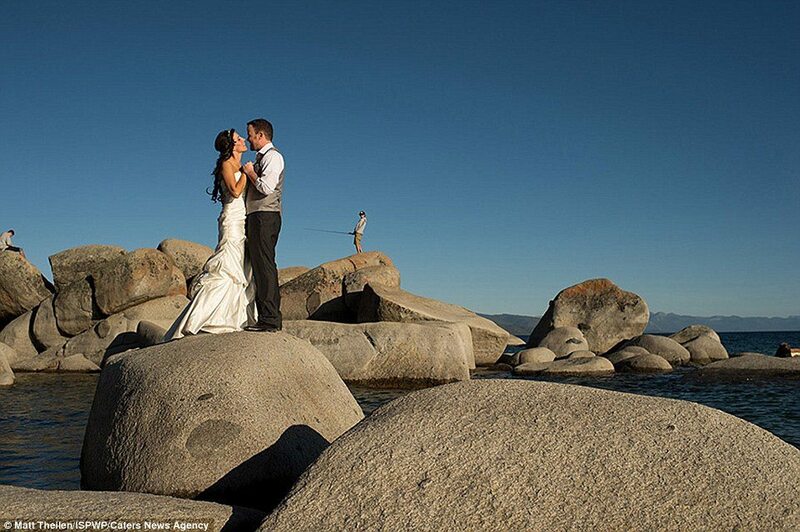 You should probably make sure the beach is clear of people before taking your wedding photos! This guy thought it would be funny to be included! In the United States, June is the most popular time for a wedding to happen, with the second most popular month being August! Expect lots of sunny, outdoors summer weddings! Maybe this couple should have picked a different month! Clearly writing on your underwear is a thing for guys! This husband thought it would be funny to surprise his wife with his new boxers but I don’t think she is liking it! The next photo includes a celebrity cameo! Times Square in NYC really is not the best place to do a photo shoot. There is way too many people and most of them will not be polite and ruin your photos! The guy who photobombed this photo, though, isn’t a random stranger! 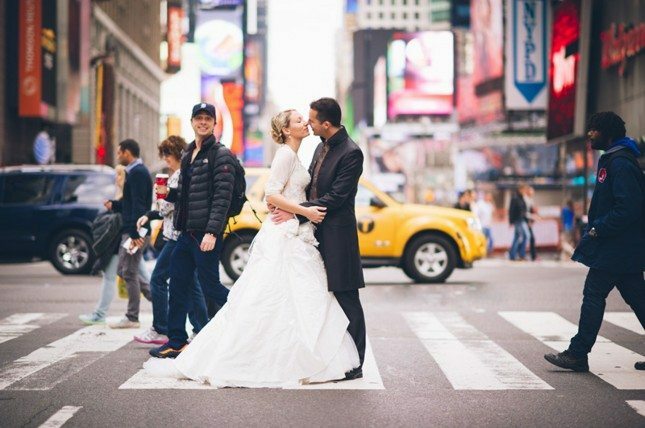 He is actually the actor, Zach Braff (the star from Scrubs) who happened to walk by the German couple’s photoshoot! 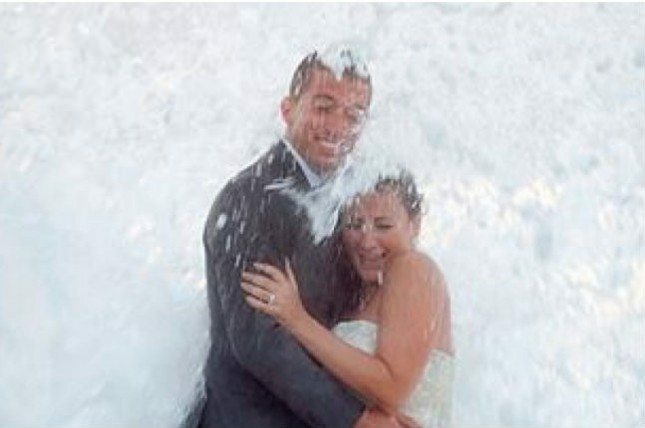 The couple didn’t notice what he did until the got home and went through the photos! 25. Here comes the veil! Maybe you should think twice before having a really long veil! Or maybe just make sure the person behind isn’t so close! By the looks of her face, I bet that hurt! In ancient cultures, wedding guests would tear off parts of the bride’s veil and gown as a token of good luck, which eventually led to the tradition of a bride throwing her garter during the wedding ceremonies. This bride is losing a nice chunk of her veil, leading to many years of good luck for her! the next photo is absolutely hilarious, though very, very unfortunate. I have never worn a wedding dress but I can imagine it is very difficult to walk around in. If it would have been easier to maneuver in, maybe the dog wouldn’t have had time to pee on her! Did you know that before 1840, most brides simply wore whatever beautiful dress they wanted on their wedding day? The white dress became a tradition after Queen Victoria wore one when she married Prince Albert. Maybe it would have been better for this bride to wear a different dress, though! The royal wedding between Princess Kate and Prince William on April 29th, 2011 was watched by millions and millions of people around the world. It was the most talked event of the year but what a lot of people commented about was that the 3-year-old bridesmaid, Grace Van Cutsem, was very unhappy! Did you know that early Roman brides would carry herbs, mainly garlic and rosemary, under their veils as a symbol of fertility and fidelity? They were also supposed to help ward off evil! This tradition of carrying herbs became the precursor to modern bridal bouquets. Maybe Grace should have received a herb bouquet to ward off her grumpy spirit! 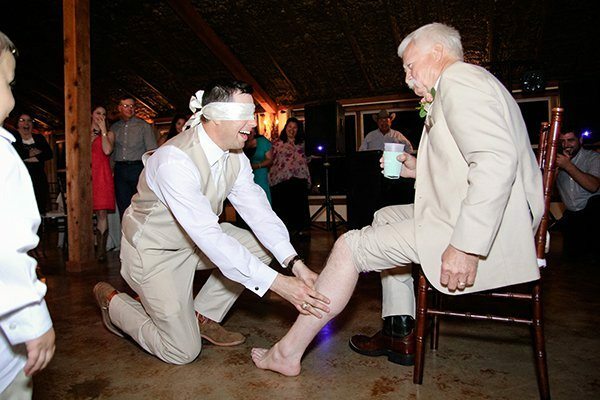 Don’t forget to SHARE this article if you think these wedding fails are hilarious!